For centuries traditional storytelling has used animals in place of humans. From Aesop's fables to George Orwell's Animal Farm, our furrier counterparts direct our moral compasses while exhibiting humanistic traits. 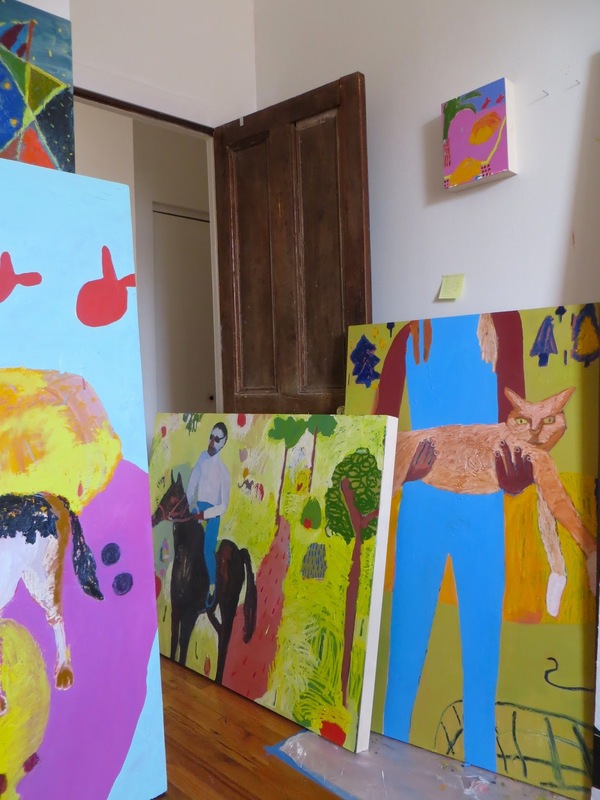 Kimia Ferdowsi Kline's studio in Fort Greene was stacked with juicy marked up oil paintings of jackals, cats, horses, and fish all inspired by the ancient Persian book “Kalila and Dimna,” a collection of interrelated animal fables in verse and prose. 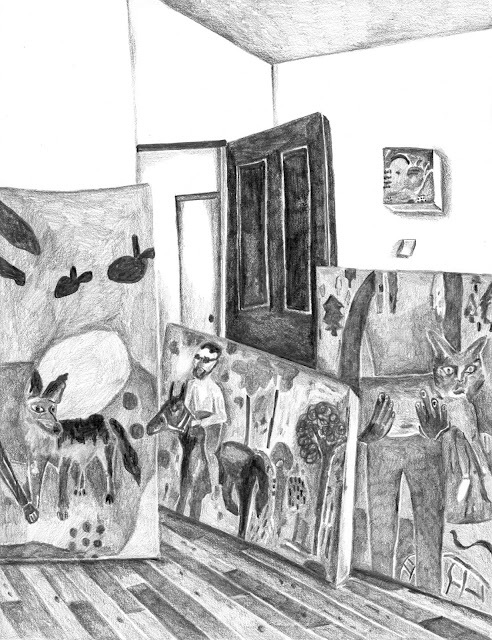 The jackals, Kalila and Dimna, who narrate the story, sat upright and bright in the foreground of one of Kimia's canvases, illuminating the room as we spent the day working alongside one another in the breeziness of early spring. I am hooked on the verve a studio has just before a body of work is completed. Kimia's studio was overflowing with it, only a few days away from shipping her new suite of paintings to Detroit, Michigan for a solo show at the Elaine. 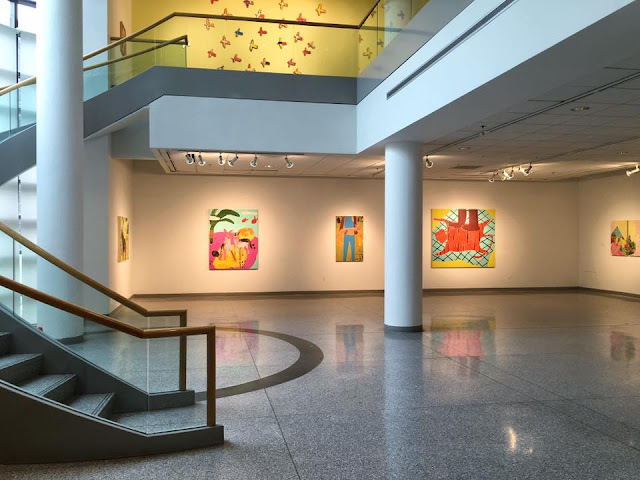 L. Jacob Gallery, a part of Wayne University. The large stellar painting that she worked on while I was there went from a vibrant red to black to white; the silhouettes of previous coats being saved along the way and seen riffling through her layers. A flock of birds was scattered across her dining room table, as though en route to Detroit. Kimia and I talked over the possible background colors she would use to accentuate their soar when she installed them in the gallery. The playfulness of the neon colors and varied feather patterns gave each of them their own story to tell. On one canvas a woman wearing a startlingly blue jumpsuit stretches a marmalade cat, who takes the focus of the painting, across her arms. The cat's expression fills in for the missing face of the figure and reminded me of the anthropomorphized felines in Persian mythology. I delighted in recapturing these creatures' whimsical and luscious qualities, but even more so in the spontaneity of the painter's imagination. In the afternoon Kimia whipped us up a blueberry smoothie and we took a break from our work to talk about her other work, curating for the Wythe Hotel. Artists make fantastic curators. 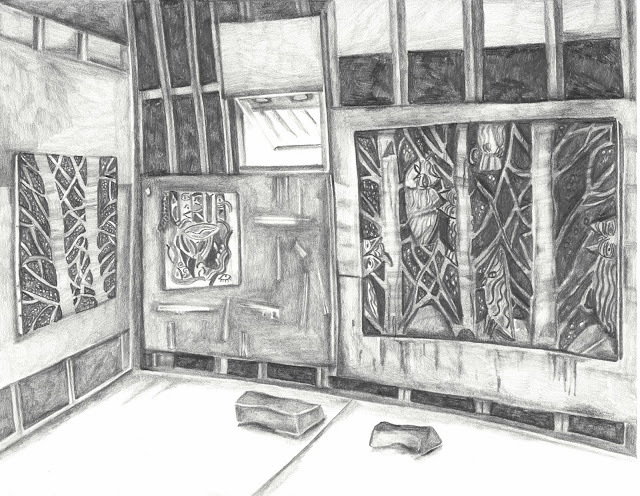 With 70 rooms to fill, her project takes her to a lot of studios, and like myself, she gets great joy from it. To see more of her work go here http://www.kimiakline.com/ and if you happen to be in Detroit please see her show "As Above, So Below" at Elaine. L. Jacob Gallery up until June 24th. Driving under the excitement and relief of the open California sky, I made my way down CA-210 this past March from LA to Joshua Tree. About a half hour outside of our destination, my husband and I started spotting the storied trees themselves. Some of them live to be a half millennium old, and as they twist and turn between a tree, a cactus, and a dancing Shiva, their powers felt intoxicating. 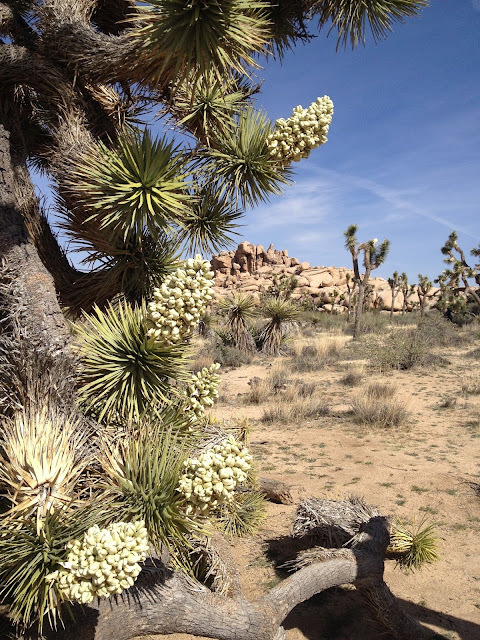 Blooming while we visited, their sweet scented waxy green flowers set against the cerulean dessert sky like a vision, waving us into the Mojave. A year ago, I ran into Ryan Schneider in NY at an art fair and he told me that he was spending the winter in Joshua Tree. His eyes and heart seemed wider than usual and he continued on to tell me that he wouldn't be coming back. Having always wanted to go there, I then made it a goal to visit him before the next year was up. His recent work, incorporating the mysticism of trees, the female form, and the heavens shining at night, seems to have found its home in the desert of California. And so has he. and curious in their posturing, Schneider's feathered friends winked like the tiny stars that peak-a-boo through the canvases' kaleidoscopic under paintings. As the shape of the owls merged with the patterns of the tree limbs, I was reminded of the harmonious balance between the natural world and nighttime, peaceful, but vibrant, just like Ryan's paintings. 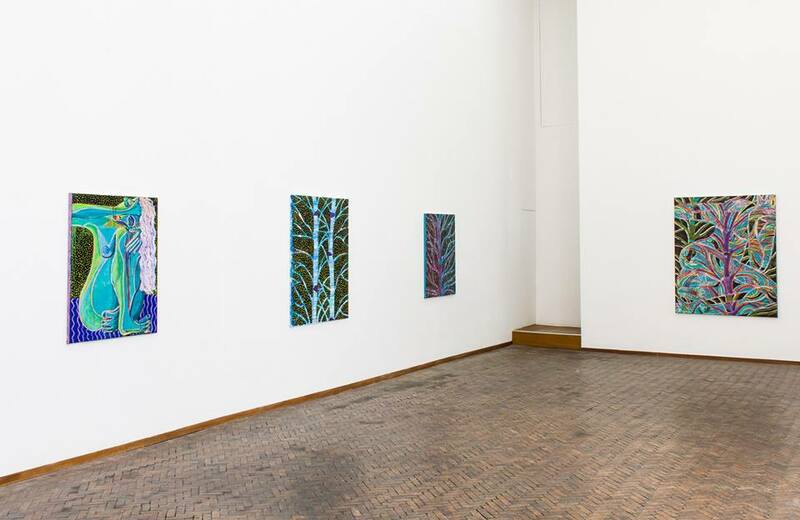 Schneider's solo show, which opened at Gerhard Hofland in Amsterdam last week, highlights both his nocturnal tree paintings and his figurative works. 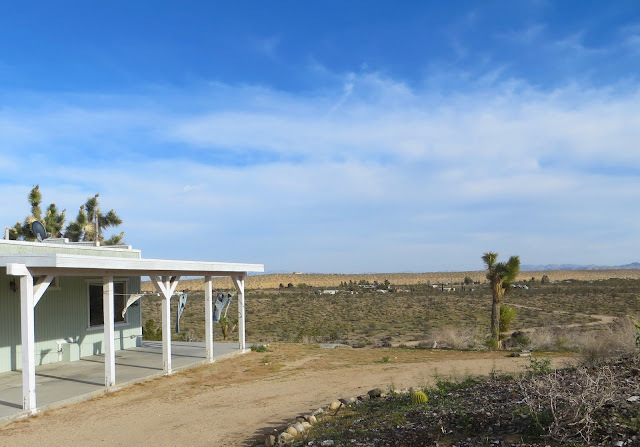 The figures bend and arch, much like the native Joshua trees surrounding his studio and imitate the curve of a boulder or a desert horizon line. I relish in the saturation and potent contrast of the colorful lines that repeat around their forms. Parts of Schneider canvases are built up, allowing the oil paint to slowly build a strata, crusting up layers like the earth. He explained that when he started to work in the desert, he battled with the sand that would collect on the paint after the wind had blown. Succumbing to the desire of the desert to become one with his paintings, he then began to occasionally add the carcass of a Joshua trees to their surfaces.